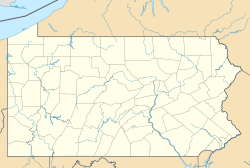 Erwinna (/ɜːrˈwɪnə/ ur-WIN-ə) is an unincorporated community in Tinicum Township, Bucks County, Pennsylvania, United States, with a zip code of 18920. It is located approximately 40 miles north as the crow flies of Center City Philadelphia and has an area code of 610. It is named after Colonel Arthur Erwin (also "Irwin"), who was a leader in the Bucks County Militia. A concise biography of him has been created by the DAR Chapter bearing his name. Colonel Erwin is said to have supplied many of boats that were used by George Washington and the Continental Army to cross the Delaware en route to the Battle of Trenton on the morning of December 26, 1776. The Erwinna Covered Bridge, Riverside Farm, Stover Mill, and Isaac Stover House are listed on the National Register of Historic Places. ^ "Erwinna". Geographic Names Information System. United States Geological Survey.